Let’s face it – there are a lot of commercials on television that are just plain irresponsible as well as tasteless. One example – the numerous car commercials that show reckless and dangerous driving but then contain the very fine print “professional driver; closed course.” Or how about the cell phone commercial (think it was Alltel) where the woman cuts down telephone utility poles with a chainsaw (vandalism)? A current Alltel commercial really ruffles my feathers. It is the one where a roller coaster is the central theme and what appears to be a family is in an area that is always closed off to keep people away from the speeding trains and/or any moving parts of the ride. 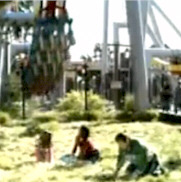 In the commercial, a child, mother and father are searching for things that riders may have lost during the ride (money, sun glasses, etc.). While this may be amusing, it promotes an action that is very reckless and can be deadly. In fact this was the case last June when a 17-year-old South Carolina teen died after being struck by the “Batman the Ride” roller coaster at Six Flags Over Georgia. Asia Leeshawn Ferguson, along with another teen had climbed over two 6-foot fences — a wrought-iron style park perimeter fence and a second chainlink fence around the Batman ride — in order to take a shortcut to get back into the park after lunch. Ferguson was decapitated when the ride struck him. Then you have this Alltel commercial which I assume was made after the accident (it is in rotation right now) where people are in the same type of “restricted” area looking for change and other items that people may have lost when riding the coaster because their cell phone bills are too high. Here is the actual commercial. While Alltel has many commercials that are quite clever as well as humorous, this is not one of them but is in fact very tasteless and disrespectful to the teen that was killed. It is commercials such as these that just make my jaw drop at times and wonder what their ad agency (of whoever else is responsible) was thinking at the time they came up with the idea. It shouldn’t take much brains to figure this out, but when executives collectively seize on an idea, it’s amazing how blind and dumb they can be. Thanks for your comment on the United story. Looks like the world is full of clueless companies.